The Internet is a busy place and things happen here every day. In order to take advantage of the world-wide reach of this exciting tool, it pays to know what is happening in the online world around you. However, the sheer magnitude of this resource can be frightening. Internet traffic is moving exponentially faster every year, and the volume of users continues to grow in every corner of the globe. What may have started as a fun hobby or a luxury is now a necessity for most people. Business people traveling look for hotels with free wifi; students do all of their assignments online; and now smart phones are taking mobility to a whole new level. 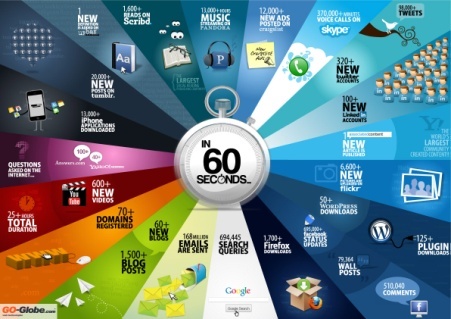 Here is a list of things that happen every 60 seconds on the World Wide Web. You can read the list in the “old-fashioned” way, or study the included infographic, which summarizes the information in a visual format that is easy to read. See which you prefer! Many people like infographics because they condense large lists of information into an easy-to-scan and read format that is much more visually appealing and engaging. In fact, using infographics in your SEO strategy may help to engage your readers far more quickly than any other method. Responsive web design is built on the idea that engaging readers takes more than long lists of text; it needs colorful, vivid images that capture the user’s attention and involve him or her in the data being presented. While both sources of information are factual, which do you prefer to read? If you are like most people, you prefer the infographic format. Your customers will, as well. To see how Orange County SEO can help you tap in to the massive potential of Internet marketing, contact us today. We can set up your website, structure your ad campaign and provide you with vivid infographics that capture your readers’ attention. Orange County SEO is your one-stop place for all your Internet advertising and web management needs.